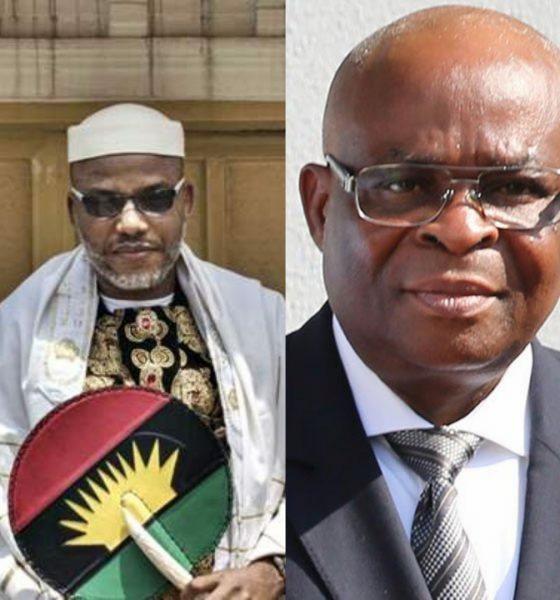 Mazi Nnamdi Kanu, the leader of the Indigenous People of Biafra, IPOB, has reacted to the suspension of Walter Onnoghen as the Chief Justice of Nigeria, CJN, by President Muhammadu Buhari. Buhari had on Friday suspended Onnoghen and appointed Tanko Mohammed as the acting CJN. In a statement sent to Press, Buhari said the order demanded that the CJN be suspended pending the determination of his ongoing trial at the tribunal. Reacting, Kanu said Onnoghen’s suspension should unite those who believed in the struggle for the actualization of Biafra. Kanu, while describing the development as the humiliation of Onnoghen, said Fulani cabal must not be allowed to conquer the South East. In a tweet, Kanu wrote: “I am back in the UK to continue our excellent work to liberate #Biafra from the pit of darkness, Nigeria. “Fulani cabal with their herdsmen, ISIS, and Boko Haram must not be allowed to conquer us.